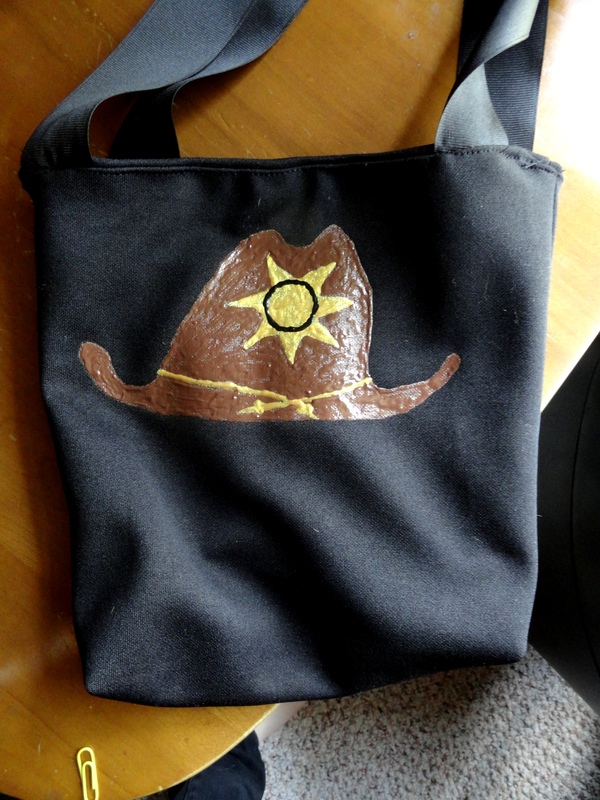 I have recently become involved in the website Craftster, a forum for crafters of all sorts. They have organized swaps all the time, each with different categories, where you get a partner, make a few crafts, then mail ’em in. Last week I sent in the crafts for my first ever swap! The theme was the Walking Dead and I loved it. I had a great partner and can’t wait to participate in more swaps soon. 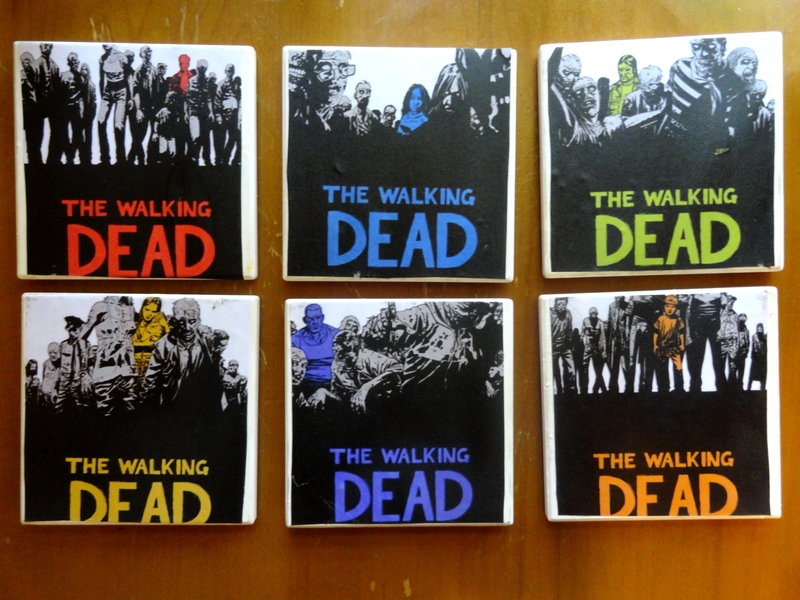 The first craft was coasters with covers of the Walking Dead books, one through six. 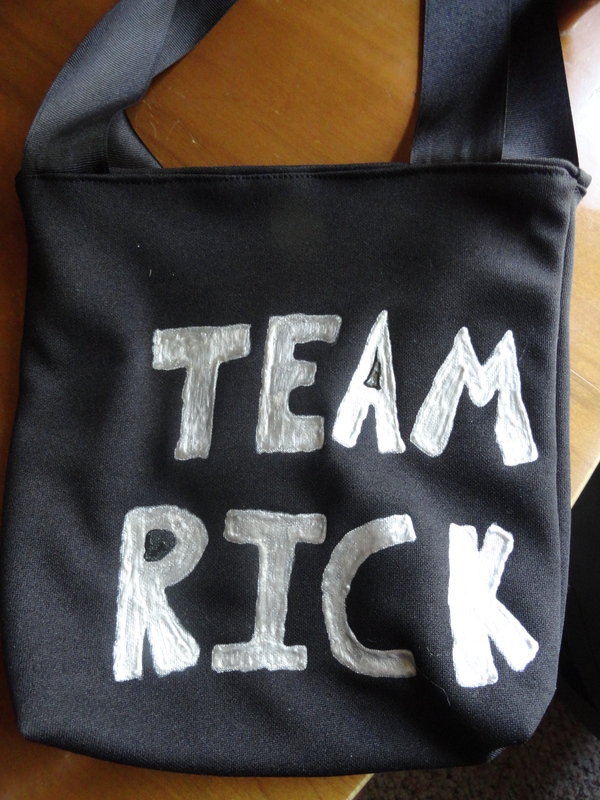 Since Rick was my partner’s favorite character, I also made her a Team Rick bag. 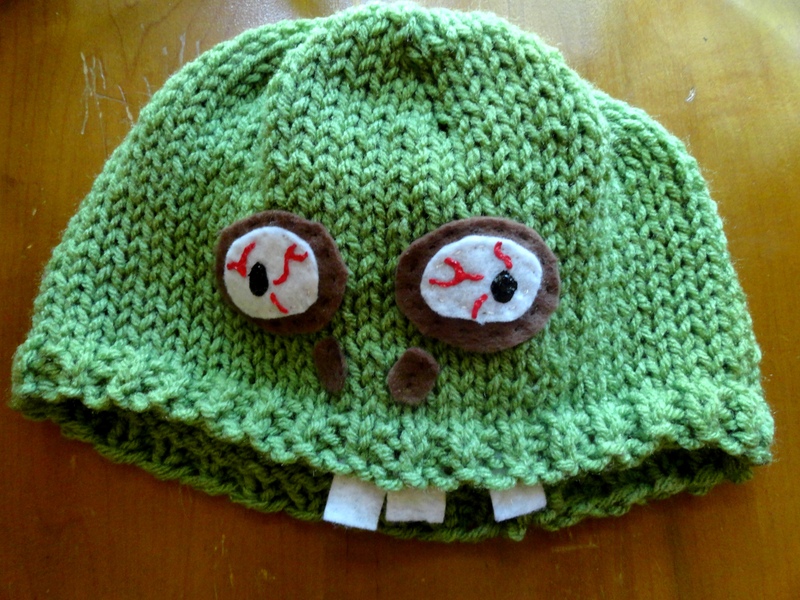 And lastly, a knitted zombie hat! The teeth were my favorite part in making this. 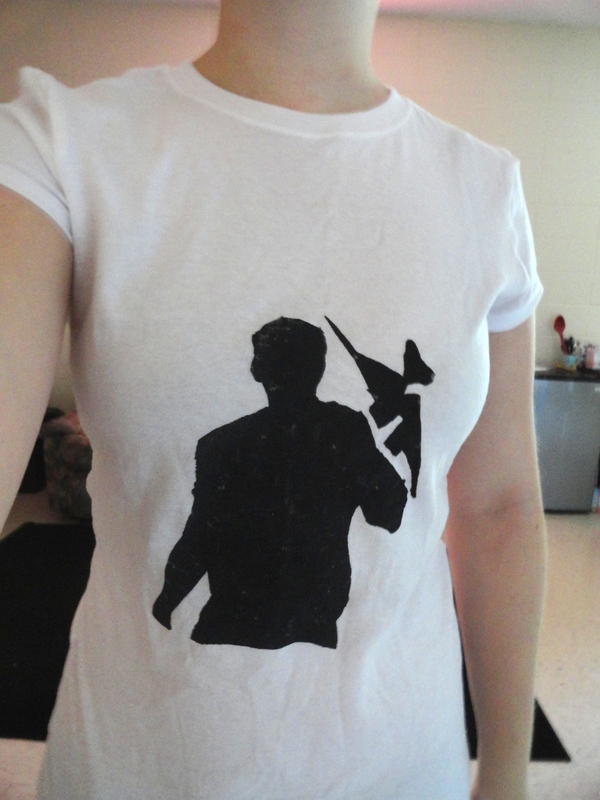 In return, my partner sent me this sweet t-shirt with Daryl and his nifty cross-bow screenprinted onto it. She also drew me an awesome version of that creepy hospital door saying “Don’t open, dead inside” (not pictured). I greatly encourage anyone with a crafty streak to check out Craftster and their swaps. Craft Journal: Llamas, Germs, and Mexican Food. 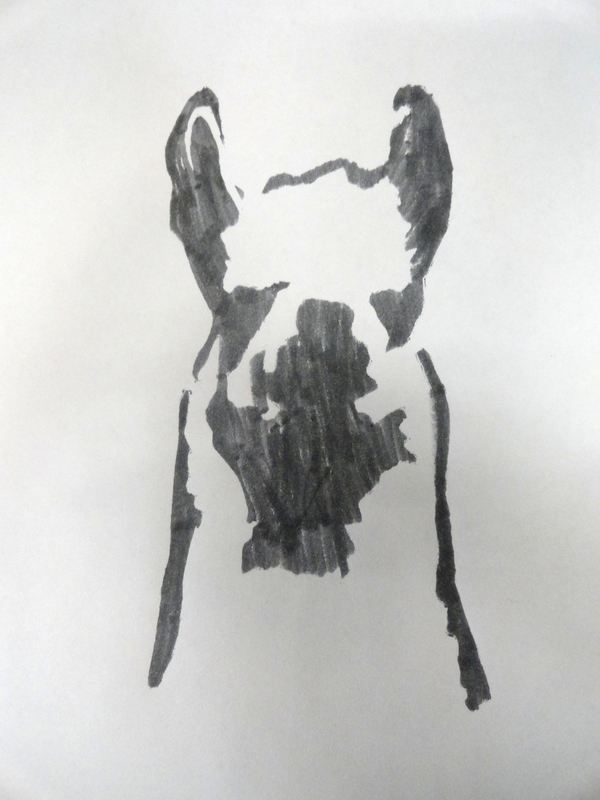 Day 7 – the prompt was “Make a stencil and use it in your work.” So I found a llama drawing online, took out my exacto knife, and started cutting away! 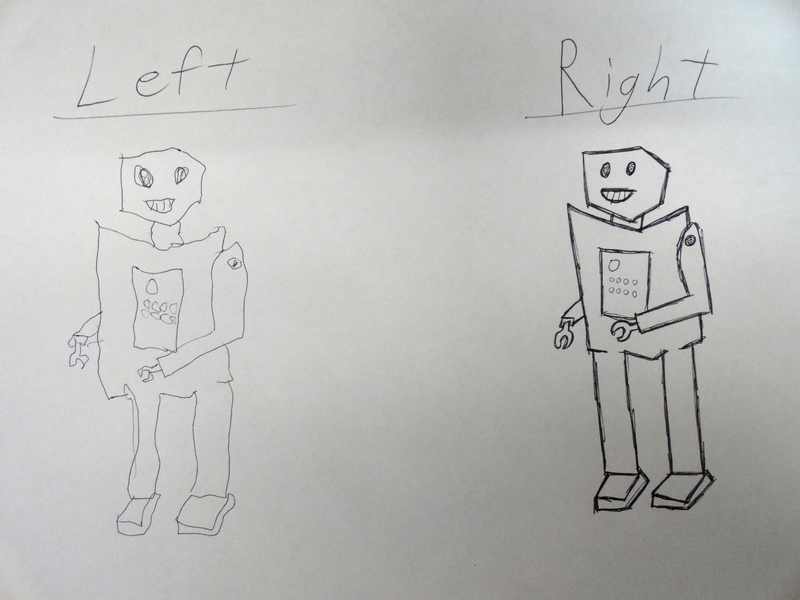 I then used a grey marker to stencil it onto paper. Day 8 – the prompt was “Transform an old book into something new.” I had just finished organizing my collection of books and taking out the boring ones I’d already read, so I had a plethora of books to choose from. 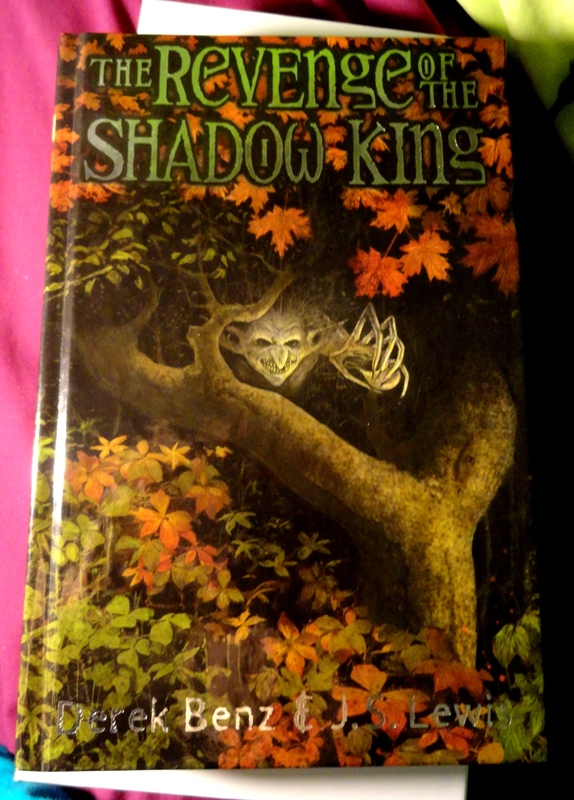 I picked The Revenge of the Shadow King though, because the creepy cover is awesome. I (once again) took my exacto knife and carved out the majority of the inner pages. I then painted the edge of the hollowed out book with glue, to make it a more solid surface. 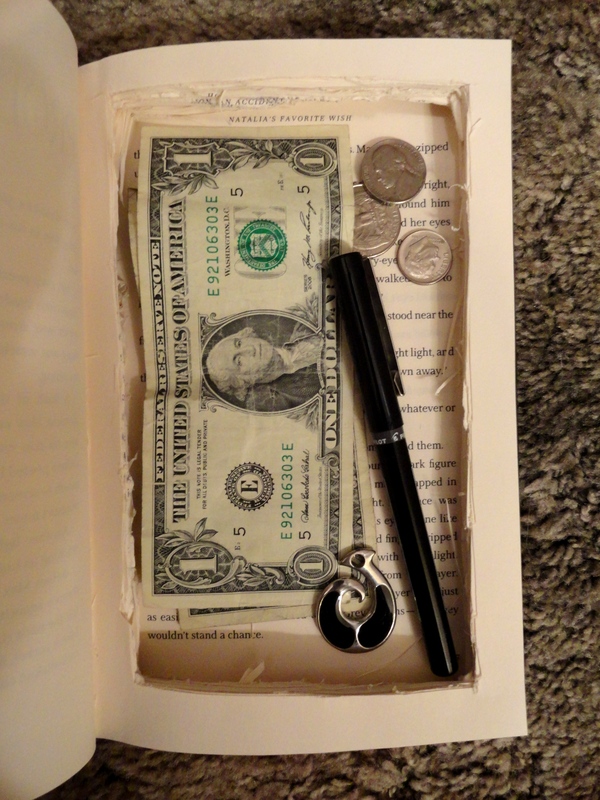 Now I have a secret compartment to hide money, jewelry, and small animals! 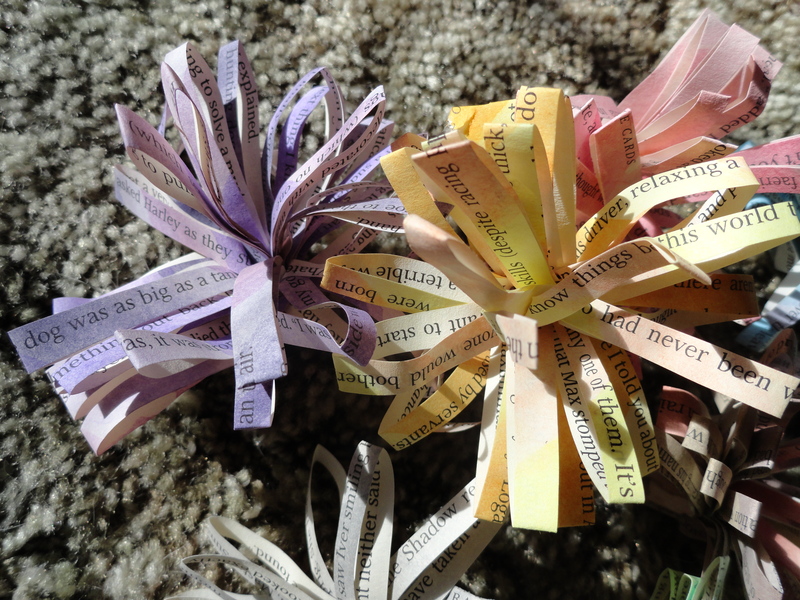 I couldn’t bear to throw away the book pages, so I used water colors to paint them, and then found a paper flower/pom pom tutorial. I really have no idea what I’m going to use these pompoms for, but they are too adorable to throw away! I may attach them to ribbon and string them across my dorm room as decoration. Day 10 – the prompt was “Use only water as your inspiration today.” Coincidentally, it rained that day. 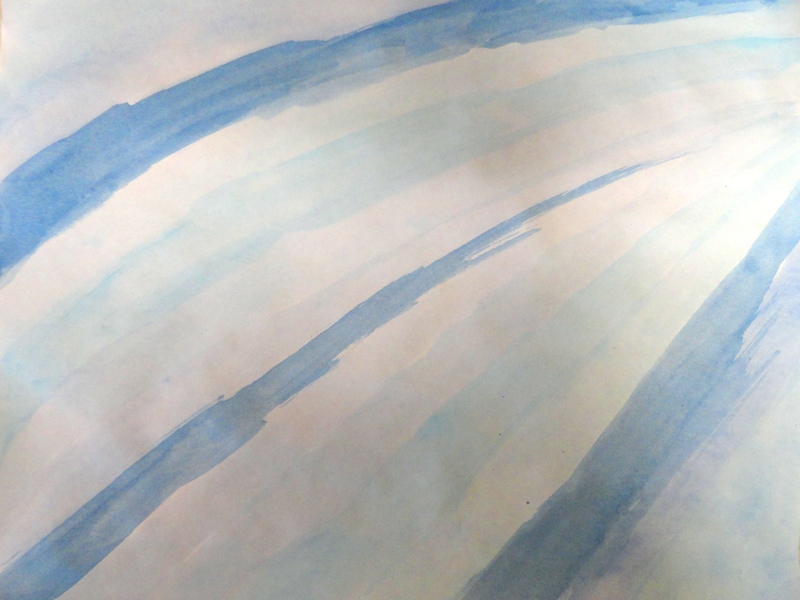 So I used a cup to collect some rain water, and used it in water colors to paint out different shades of blue. Day 12 – the prompt was “Make something camouflage.” When I hear camouflage I think of what most others do too: rednecks, the army, hunting. But I also think of octopuses. Since my sister loves tv shows about weird underwater sea-creatures, I have seen quite a few octopuses changing color. If you really want to appreciate their camouflage abilities, watch the video below. 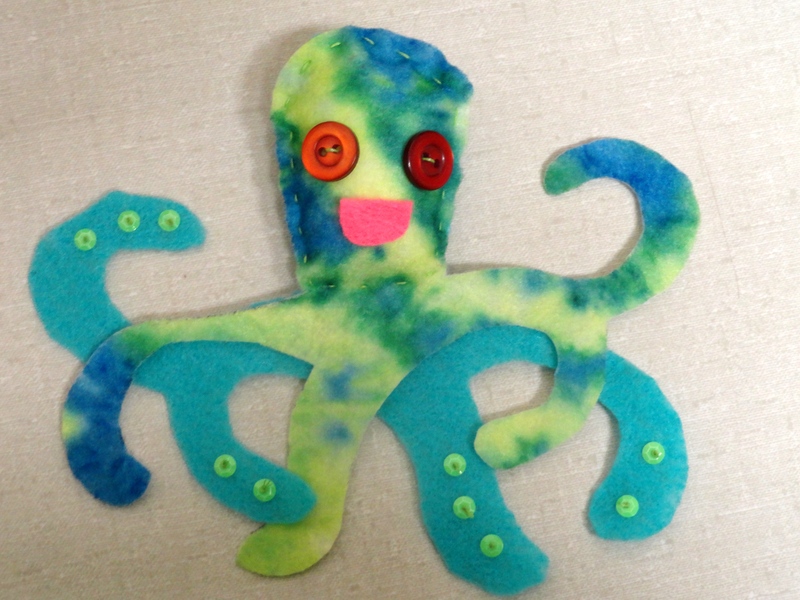 And so, inspired by mother nature’s handy work and after seeing an adorable felt octopus on the blog Futuregirl, I made this precious octopus! He’s just looks so happy to be visiting on my desk and not in the deep sea. Day 13 – the prompt was “Use tea leaves, tea bags, or liquid tea to create something today.” So I grabbed two tea bags from the cafeteria, some paper, and paper glue. And tada! 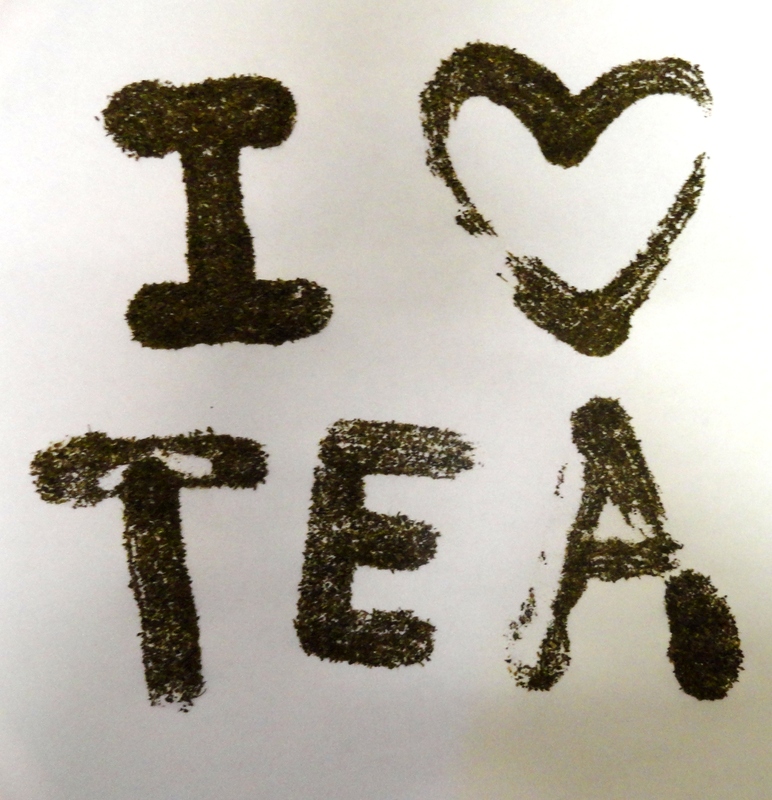 It looks a bit like dirt, but it’s tea, I promise. 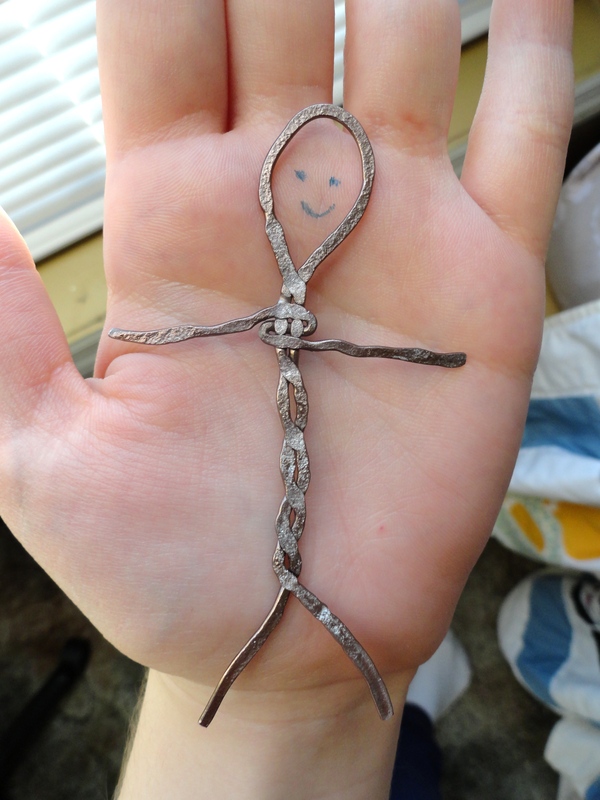 Day 14 – the prompt was “Make something microscopic.” Since I am not talented in the field of making things that are invisible to my naked eye, I did the opposite and made a tiny thing bigger! 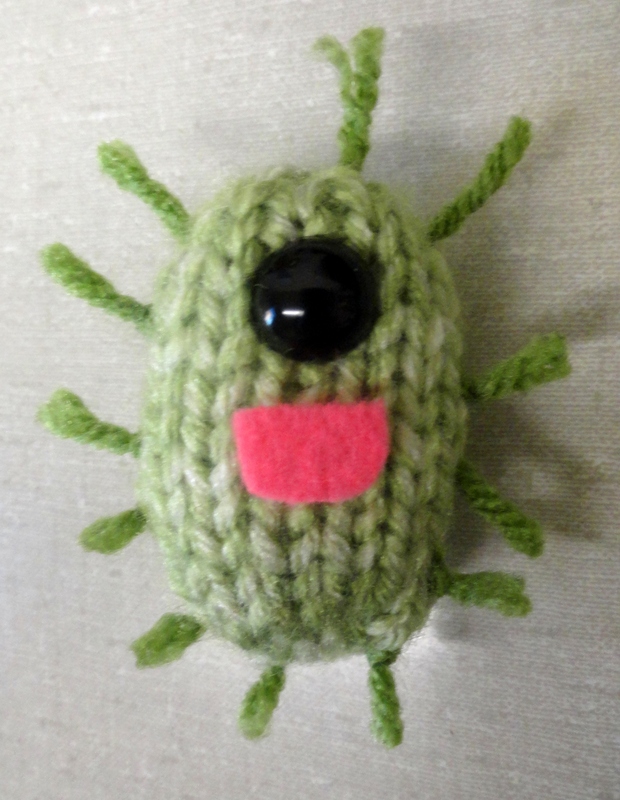 I knitted up Jimmy the Germ. He loves giving you a cold, the flu, or the stomach bug. But he’s just so sweet looking that you might not mind. 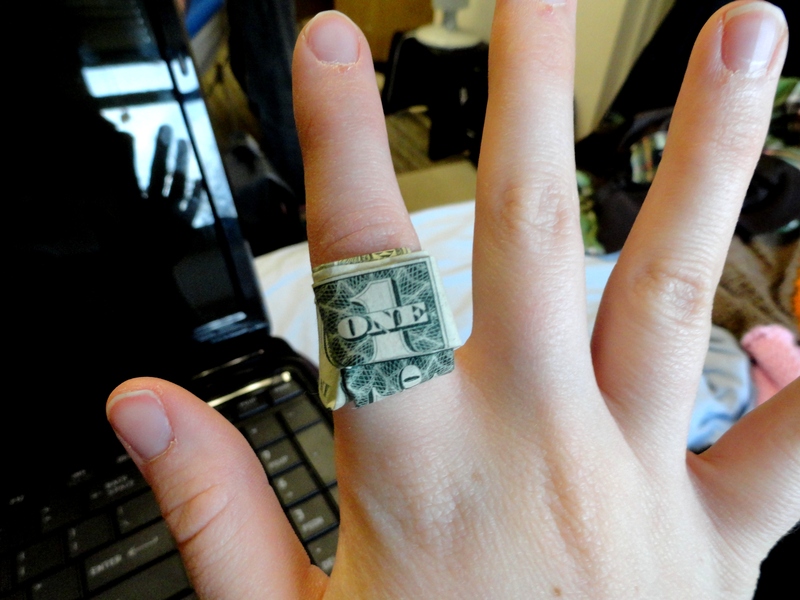 Day 15 – the prompt was “Use a dollar bill as your medium or inspiration.” I have seen some really cute money origami, so I searched it online and found a tutorial for making a dollar bill ring! And I like myself, so I put a ring on it. 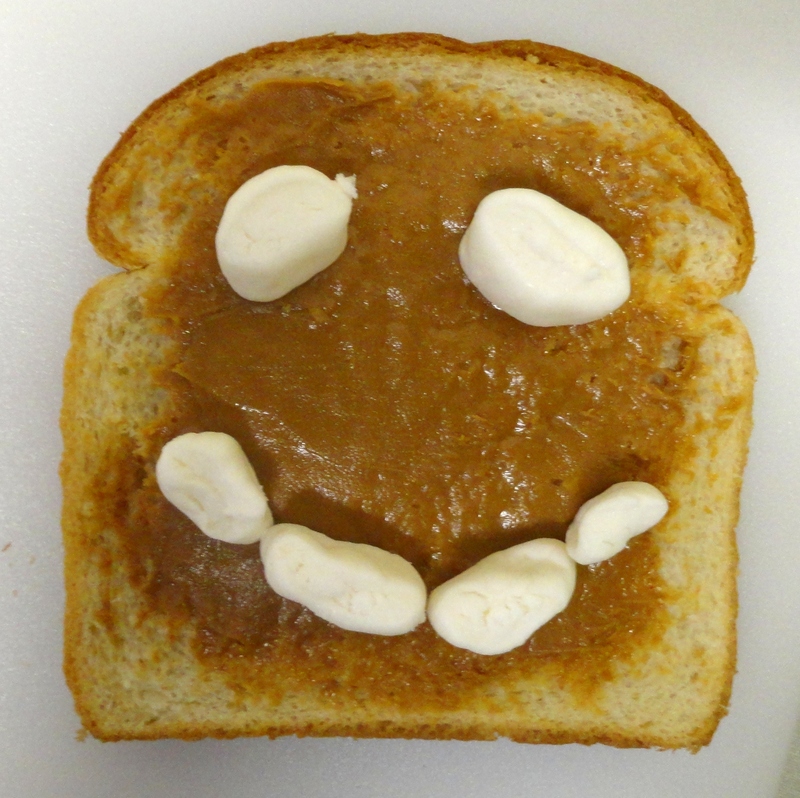 Not part of the craft journal, but here is the delicious lunch I made today for myself and Peter. 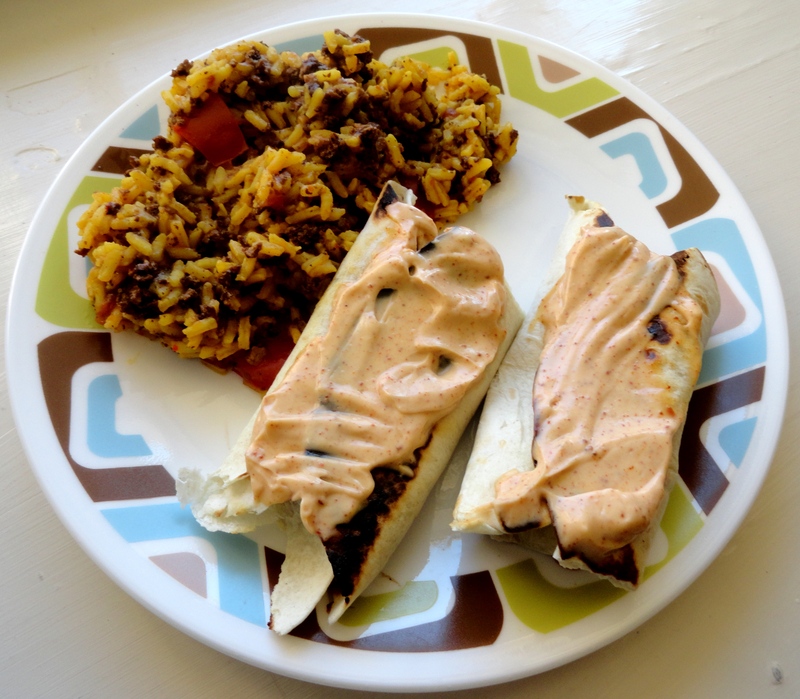 Toasted refried bean enchiladas that were smothered in creamy enchilada sauce, and paired with Spanish rice that had spiced veggie crumbles and fresh tomatoes mixed in. I can’t wait to eat the leftovers, yum. Recently I bought the book 365: A Daily Creativity Journal by Noah Scalin. It’s a journal that provides a creative craft prompt for every day of the year. It has prompts involving everything you can imagine: Yarn, writing haikus, using leaves and twigs, and pretty much anything else to inspire you for an everyday creativity spurt. 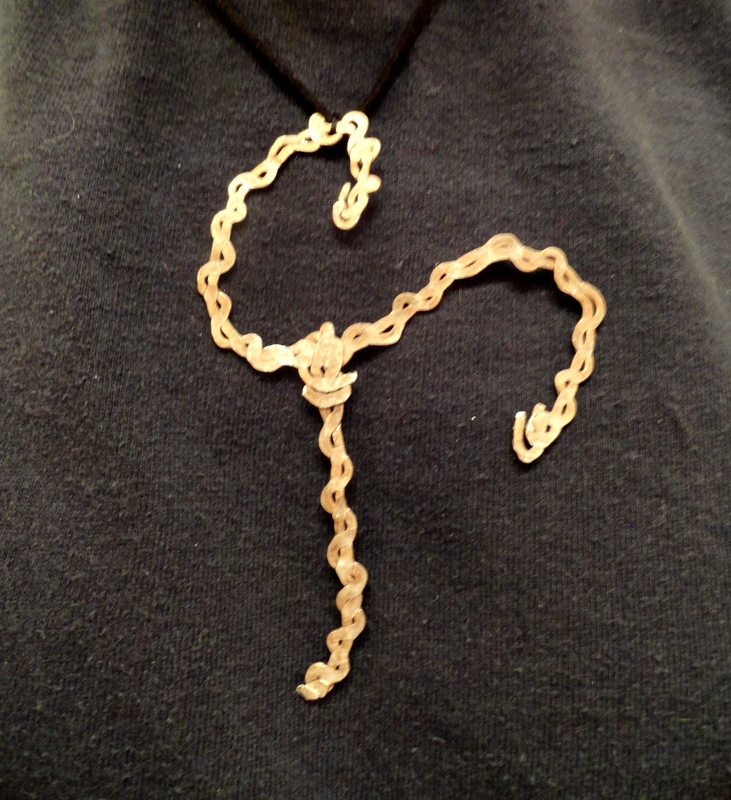 I started on January 1st, of course, and the 1st prompt is “Start small today and make something that fits in the palm of your hand and use only the materials in your immediate environment.” Since I had just finished making a necklace based around my Dungeons & Dragons character (more on that in a moment), I had some thin metal wire sitting out and the sharpie I had used to sketch out the design. 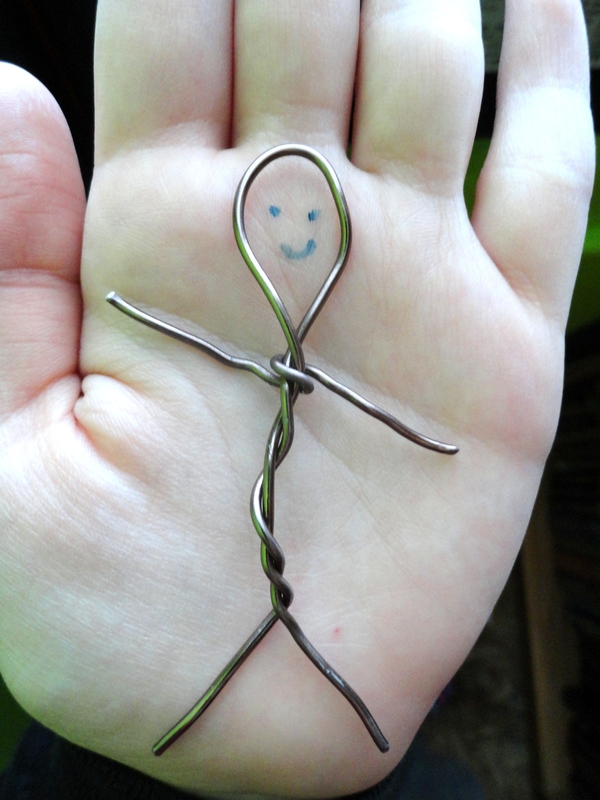 What I came up with was a tiny little stickman made from wire. After attacking it with a hammer, muahaha! Day 2- the prompt was “Use your favorite animal as your inspiration today.” Pigs are my favorite animals, so I sewed a small zombie pig head that was filled with scent beads and attached a ribbon. 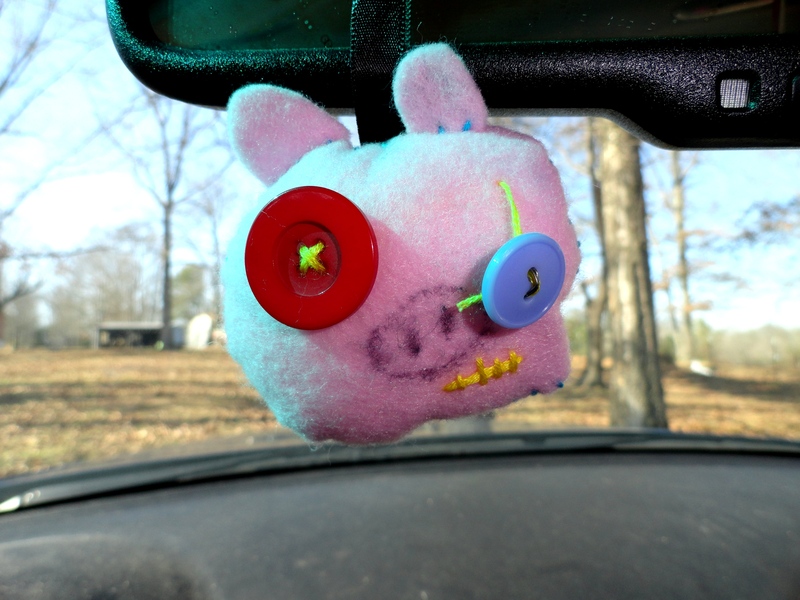 I have it hanging on my car’s rear view mirror as a cute air-freshener. 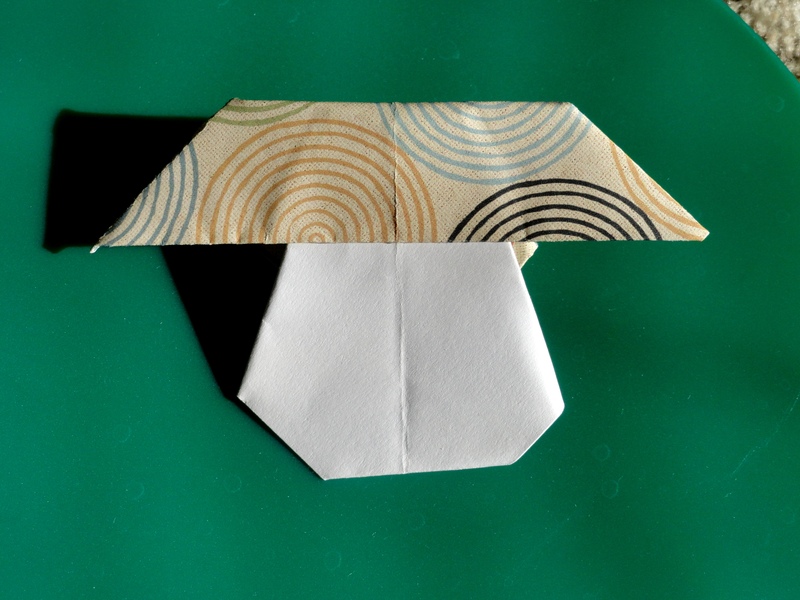 Day 3 – the prompt was “Make something with paper but do not use scissors or glue or draw on it.” So of course I thought about folding paper, origami! I searched for simple origami patterns and found this website with a mushroom making tutorial. 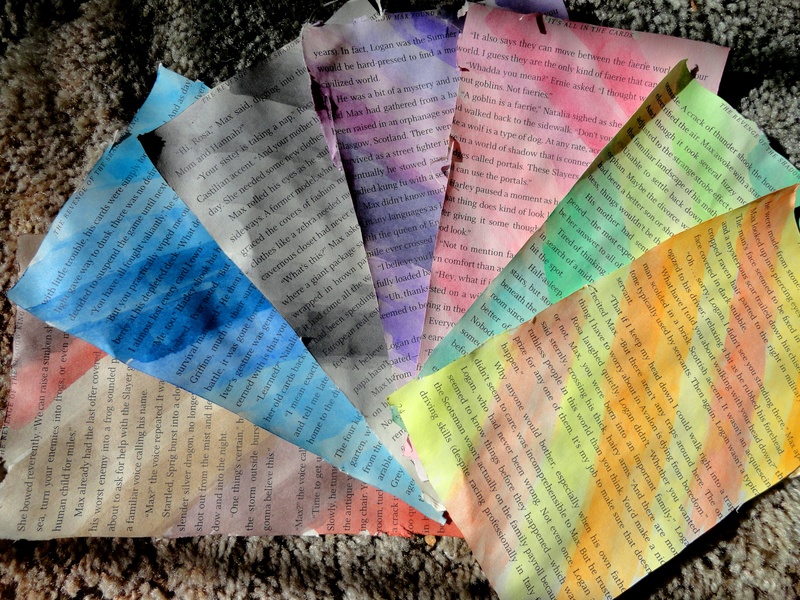 I searched through my pile of dusty scrapbooking paper and picked some that looked psychedelic. So then I folded a psychedelic mushroom. Day 4 – the prompt was “Take a 5-minute walk and make something from the things you find where you’ve ended up.” Since there is nowhere interesting near my house within quick walking distance, I bent the rules a bit and decided to grab a bag and collect cool things from a 5-minute walk through the woods behind my home. I found a perfectly intact mason jar within the first minute of entering the woods. After that, I collected pretty looking rocks, leaves, berries, and plants. 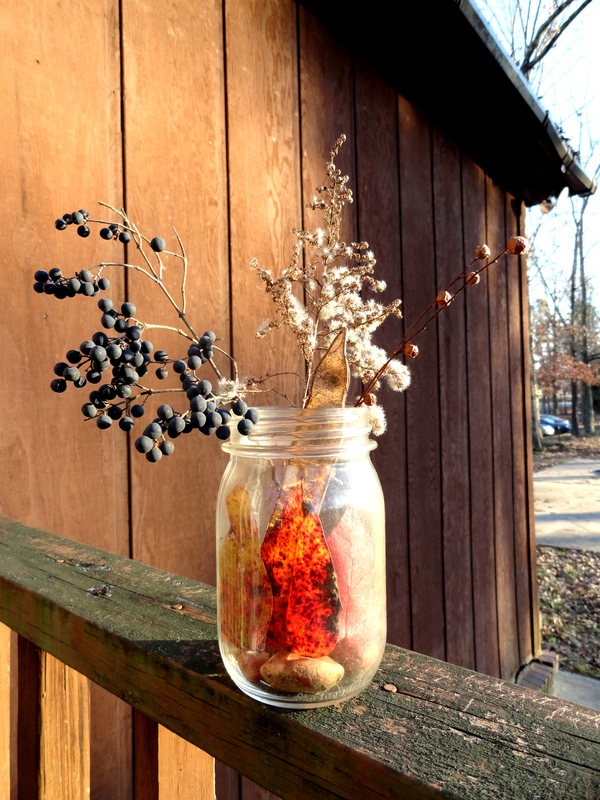 Then arranged all those interesting things in the mason jar and snapped a photo! 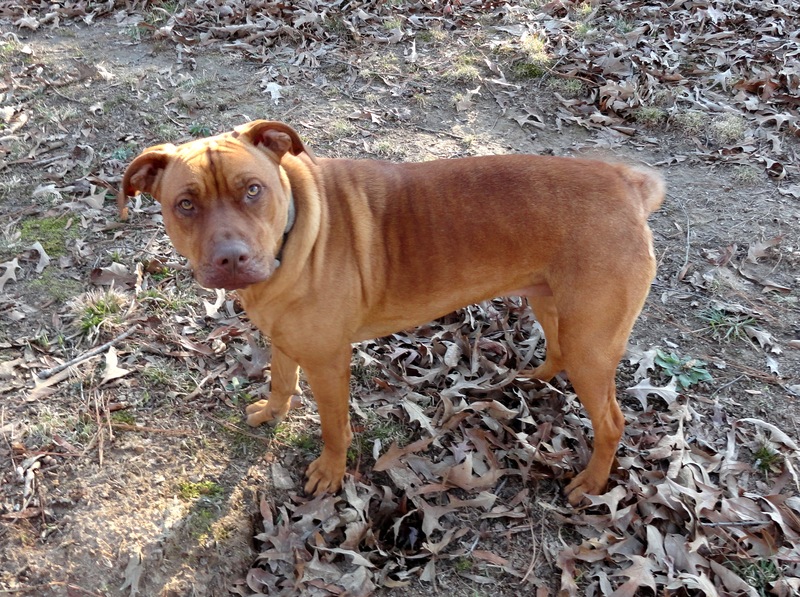 Bonus picture: Sissy the pitbull helping me on my scavenging expedition. Day 5 – the prompt was “What do you collect? Use part of that collection as your material today.” I collect a lot of things: little piggy knick knacks, decorative plates, and comic books. I couldn’t bear to alter the first two, so I started looking through my comics. When I got old enough to be interested, my mom gave me her old horror comics she had read as a kid and kept. I love most of them, but some are just plain boring. So I picked the rattiest one from the boring pile to cut apart. 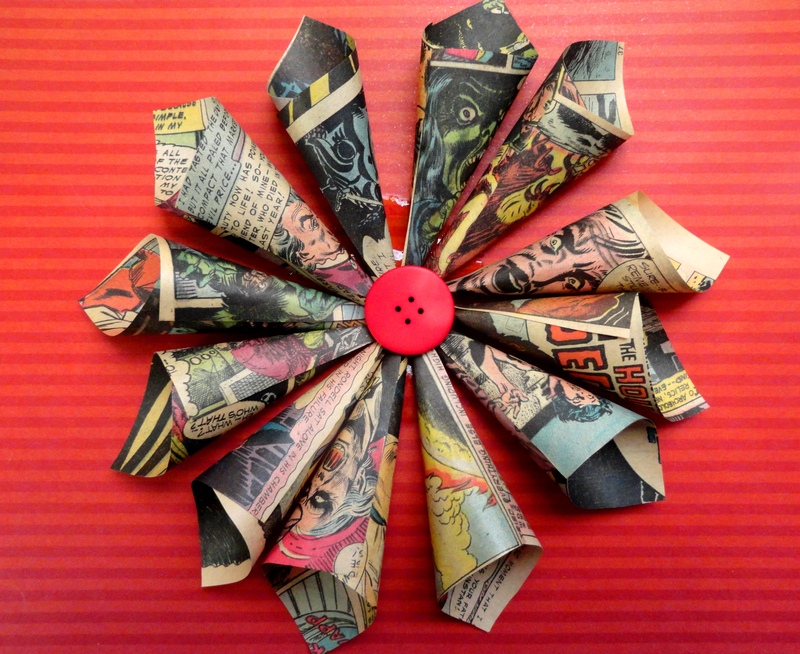 I followed the directions on this website for a decorative comic book starburst. I didn’t have any glitter, so I just skipped that step. Day 6 – the prompt was “Walk into your kitchen, and use the first fruit you see. Whether fresh, canned, pureed, or even jammed.” the first fruit I saw this morning was canned pineapple chunks. 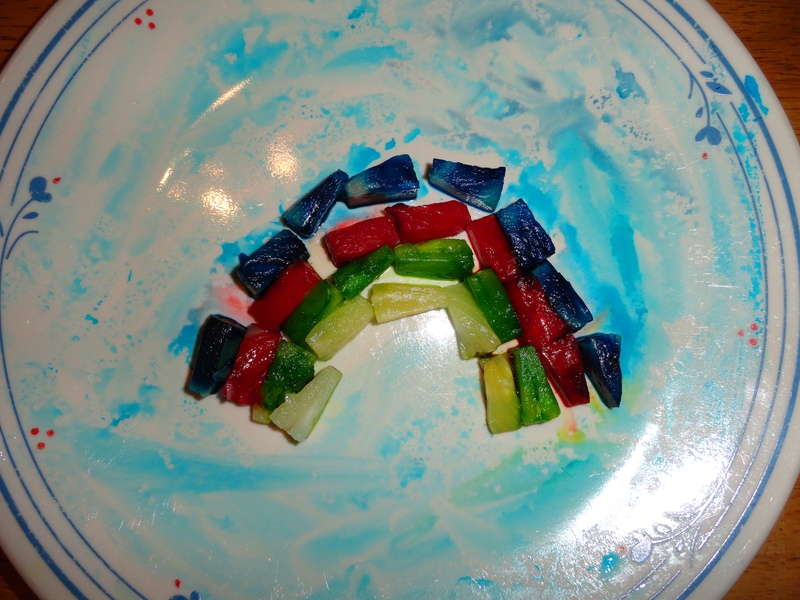 So I soaked them in food dye and made a lovely fruit rainbow!